The glamour and style of New York City has a home in Las Vegas. 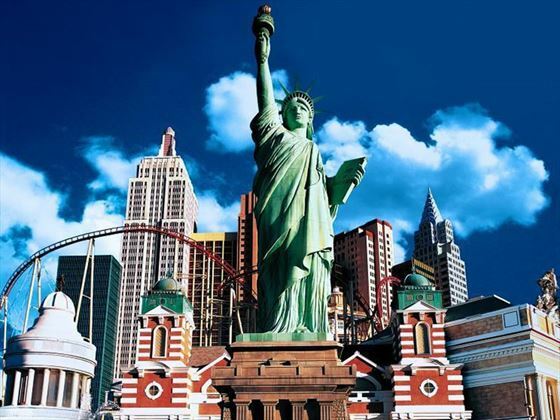 At New York Hotel & Casino Vegas visitors can take a bite of the Big Apple, enjoy Broadway-caliber entertainment, alluring nightlife and Coney Island fun. There are many touches at this hotel that will make New Yorkers fit right in at New York-New York. The resort’s facade approximates the New York skyline down to the Empire State Building, Statue of Liberty and the Brooklyn Bridge. The interior features a Central Park-themed casino and a bar in the middle of Times Square, complete with neon and flashing lights. This amazing hotel is located on The Strip, perched between The Monte Carlo and Excalibur. 2,024 Guest rooms including suites. Unwind from an exhilarating day in the city in uncompromising, traditional New York flair. The 350 square foot Skyline Room will ensure sweet dreams with one king or two queen beds and an inviting tub and shower combo. New Yorkers know food! At New York-New York Hotel & Casino, the city’s restaurants are built around the famous flavours that make the Big Apple simply delicious! Savor irresistible taste after taste of Manhattan from the sumptuous variety of restaurants. Nine Fine Irishmen - is a pub of epic proportions starring a grand Victorian-style bar, ornate cottage areas, shop-style snugs, and two levels of outdoor patio dining with a spectacular Las Vegas Strip view. Gallagher’s Steakhouse - serves only the finest USDA prime, dry-aged beef and fresh seafood. Il Fornaio - Now that’s Italian-New York-style. Traverse to romantic Northern Italy and indulge in homemade and imported pasta; wood-fire pizza, rotisserie chicken and duck; hearty steaks and chops and mesquite-grilled fish. ESPN Zone - Kicks sports-themed dining and entertainment into full throttle! Speed in for great American-grill grub. Chin Chin Café - Will stir your senses with tantalizing traditional Chinese food complemented by a colorful, vivacious setting. Gonzalez Y Gonzalez - Spice up your life with the zing of saucy Southwestern fare. America - Cross the beloved country in one delicious excursion at America, the 24-hour restaurant. Tom's Urban - A cool, industrial style eatery serving up the world's favourite street food. New York Pizzeria - Grab yourself a classic New York slice with these delicious 18" over baked pizza. MGM Grand Buffet - A delicious buffet serving up incredible gourmet dishes, including prime rib and crab legs. Broadway Burger Bar & Grill - Tasty burgers created with organic, 100% free-range Estancia beef. Breakfast at the Big Apple - Sneak a taste of the city's most beloved breakfast foods, including sensational pancakes. Village Street Eateries - Stroll through the hotel's very own Greenwich Village with its delicious sidewalk dining venues - open till 3am! Shake Shack - That's right, the famous fast food chain is now at the hotel. Nathan's - His hot dogs have been legendary since 1916 - now it's time to try them yourself. Scintillating slots. Tempting table games. A Race & Sports Book you can bet on for the hottest Strip action. Playtime has never been finer than in the Las Vegas casino rich in New York style! 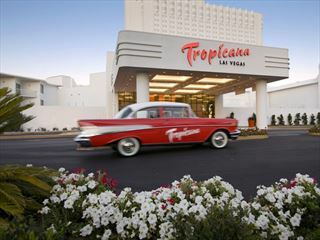 Located on the Las Vegas Strip, we love Tropicana's large pool area featuring its own swim-up blackjack table, a casino, a European-style spa and several innovative restaurants. This resort features a 30-storey pyramid and two 22-storey hotel towers with a total of 4,408 rooms. 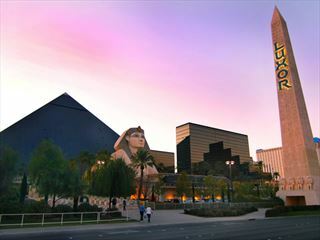 Luxor offers a 20,000 square foot spa, a 1,200-seat showroom and food and entertainment venues on three different levels beneath a soaring hotel atrium. MGM Grand - is Maximum Vegas. Step through the doors of MGM Grand and enter a world of a pure, amplified and unforgettable Las Vegas experience.